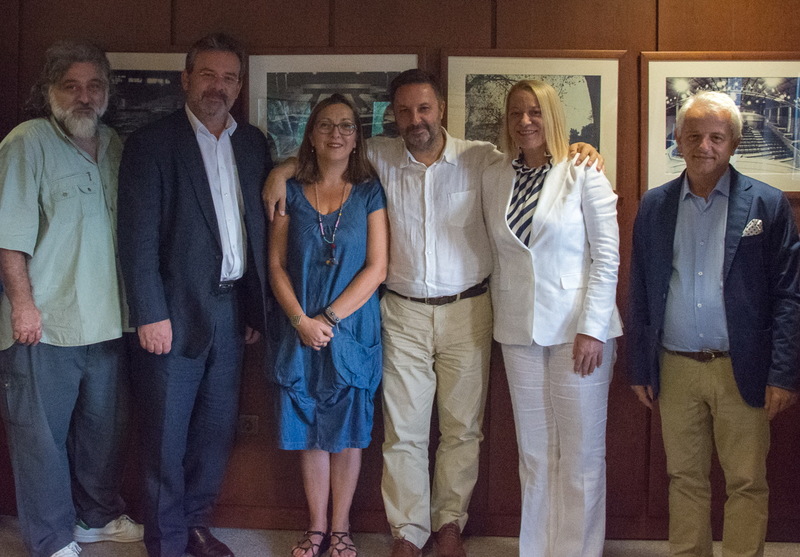 The National Theatre of Northern Greece and Hellenic Post (ELTA) have signed the renewal of their mutual collaboration for the third consecutive year, on Friday 8th September 2017 at Vassiliko Theatre. On the occasion of the participation of the Hellenic Post in the 82nd Thessaloniki International Fair and the presentation of a commemorative series of stamps, at an event hosted at Vassiliko Theatre, the President of the Board of Directors of NTNG, Aris Stylianou, the artistic director of NTNG, Giannis Anastasakis, the Chairperson of Hellenic Post, Efrosini Stavraki and the CEO of Hellenic Post, Ioannis Zaroliagis, have committed to expanding their collaboration with the implementation of new pilot actions. Hellenic Post will continue to provide postal services to the NTNG for the following year. Furthermore, Hellenic Post will have the opportunity to advertise its services through the promotional material of NTNG’s performances. The public could also be informed about these services at selected ELTA post offices. In this spirit, the prospect of a broader commercial collaboration, including the electronic sale of NTNG tickets at ELTA post offices, is explored, in order to better serve Thessaloniki’s citizens. Moreover, the promotion of philately to Thessaloniki’s theatre-goers, as well as to NTNG’s little friends, remains crucial for both institutions. The text was translated from Greek by Eleni Maniati, student at the Joint Postgraduate Studies Program (J.P.P.S.) “Conference Interpreting and Translation” of the Faculty of Philosophy of the Aristotle University, under the supervision of Dr. Christopher Lees.